This section contains links to gun shops and specialist gun dealers located throughout Wales. Tony's Tackle has been based in Caerphilly NEAR CARDIFF SOUTH WALES for over 30 years, suppling Fishing Tackle, Baits, and Shooting Equipment, along with outdoor and workwear clothing. NJ Guns are main dealer for Beretta and offer a selection used sporting and game guns, rifles, spring / CO2 and pre-charged air rifles, ammunition and accessories. We stock a selection of 12, 20, 16 and .410 game and clay shotguns, principally AYA, Beretta, Browning, Remmington, Miroku and BSA. Shooting equipment available via mail order. 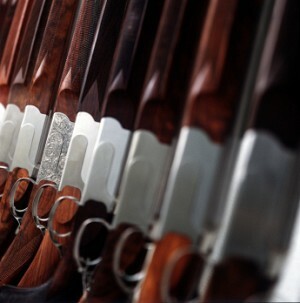 We stock the UK's largest selection of Browning, Beretta and Perazzi rifles and shotguns. We also offer an extensive range of hunting and shooting accessories and clothing. Gwynedd Firearms is a well stocked, busy, old fashioned gunshop with a good selection of second hand and new shotguns, airguns, cartridges, cleaning kits, gun cabinets and more.